If it were up to my husband, the only thing that would be cooked on our grill would be meat. Vegetables might be allowed if they were skewered on a kabob, but that’s about his limit. Whenever I mosey out to the grill with something that he thinks doesn’t belong there, I can see his eyes start to roll to the back of his head. A recent dinner at Joey’s Pasta House in Penfield might send me back out to the grill for another one of my experiments. I ordered the grilled shrimp Caesar salad, in which the shrimp, romaine lettuce and bread all took a trip to the grill. The char of the grill added an appealing change of pace to a salad I’ve had many times. I have a favorite recipe for chicken Caesar salad (from the Cooks Illustrated book, The Best Light Recipe.) It doesn’t seem hard to switch to shrimp and throw some romaine wedges on the grill. I can hear my husband groaning already. Note: This also appears on my blog on the Flavors of Rochester website. When my parents took me to restaurants when I was young, my Mom always advised me to order something I wouldn’t ordinarily get at home. I follow that approach to this day. I often opt for seafood, because some of my family has hang-ups about seafood and I rarely cook it. I was especially happy with my choice when I ordered the evening’s fish special at Max of Eastman Place during a recent night out. Sea bass was served with seasonal vegetables and fregula, all in a light sauce that had a hint of curry. The fish had a gorgeous golden brown sear; its crispy exterior gave way to the firm but flaky interior. The tender, colorful veggies and a subtly flavored sauce complemented the fish beautifully. Fregula, little balls of pasta cooked to al dente, added a nice chewy texture to the dish. It was something I never could have prepared, and I was thankful that Mom’s dining philosophy had stuck with me all these years. I’ve noticed that many people seem to stick with familiar dishes when they dine at restaurants. What is your preference? Tried and true or something new? Note: this post also appears in my blog for FlavorsofRochester.com. I usually don’t get all that excited about sandwiches. Maybe it’s the memories of lukewarm bologna sandwiches in childhood lunchboxes that linger. 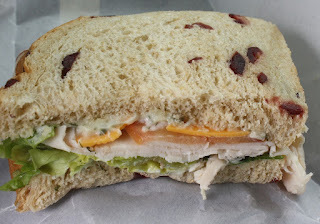 But recently, two stellar sandwiches have me singing their praises. The Thing at Java’s Café: The sandwich selection at Java’s Cafe on Gibbs Street changes frequently, but they usually seem to have The Thing (or its cousin, Not the Thing). The Thing comes with a whole lot of veggies — avocado, tomato, bell pepper, cucumber and greens – all on grainy bread. Pepper Jack cheese, tomato garlic pesto and a side of a tangy mustard vinaigrette conspire to turn all that virtuousness into a tasty treat. Java’s starts serving sandwiches at 11 on the dot – I’ve tried getting one at 10:50, and have been politely turned away. They are sold until they are gone, so if you have a favorite, it’s best to get there before the lunch rush. Three Forks Turkey at Great Harvest Bread Co.: Roasted turkey breast, cheddar cheese, lettuce and tomato don’t immediately sound out of the ordinary. A dilly herb mayo adds a little something, for sure. But what makes it really special is having it on the Great Harvest cranberry orange bread, which adds sweetness and a touch of tang. Plus, it tastes a bit like Thanksgiving dinner. 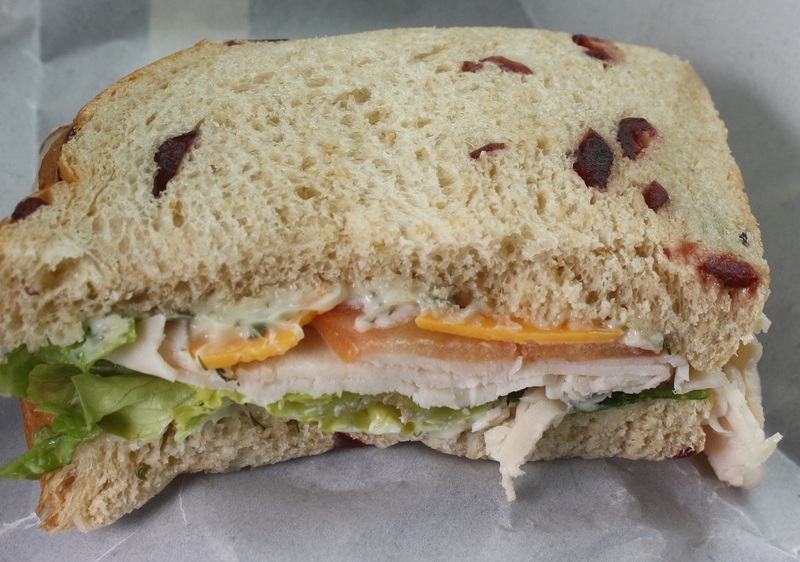 Alas, they only serve cranberry orange bread on Wednesdays, so it takes some planning to get the perfect version of this sandwich. What are your favorite sandwiches in Rochester?